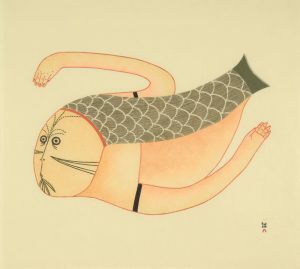 Ningiukulu Teevee’s drawings blend imagery that is often based on traditional Inuit myths with arresting compositions and a superb sense of colour. Teevee uses a combination of fine detail with broad areas of colour to create her often whimsical drawings. 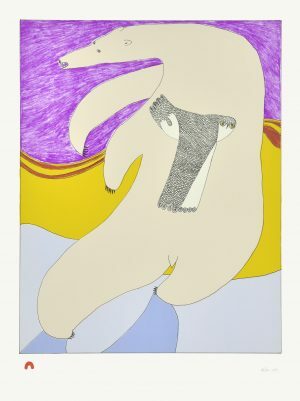 Her characteristic undulating lines and balanced compositions are also found in her prints, which have been prominently featured in annual Cape Dorset Print Collections since her debut in the 2004 edition. Teevee’s humourous and playful style lent itself perfectly to Alego, a children’s book the artist both wrote and illustrated. This publication was nominated for the 2009 Governor General’s Literary award in the category of Children’s Literature – Illustration. 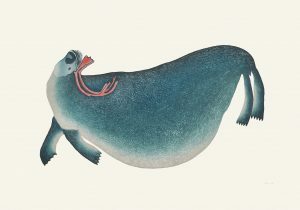 Nominated for the 2009 Governor General’s Award for illustration, for her children’s book, Alego.